Heat oven to 350°F (325°F for dark or nonstick pan). Line 9-inch square pan with foil, allowing some to hang over edges of pan. Grease bottom and sides of foil with shortening or cooking spray. Make and bake brownies as directed on box for cakelike brownies. Cool completely on cooling rack, about 1 1/2 hours. Using foil to lift, remove brownies from pan, and peel foil away. Cut brownie in half; place 1 half on serving plate. Spoon frosting into microwavable bowl. Microwave uncovered on High 15 seconds. Stir frosting until smooth. Spread half of frosting over brownie half on plate. Place other half of brownie on top; spread remaining frosting over top. Sprinkle with candies. Refrigerate 30 minutes to set. Store loosely covered. 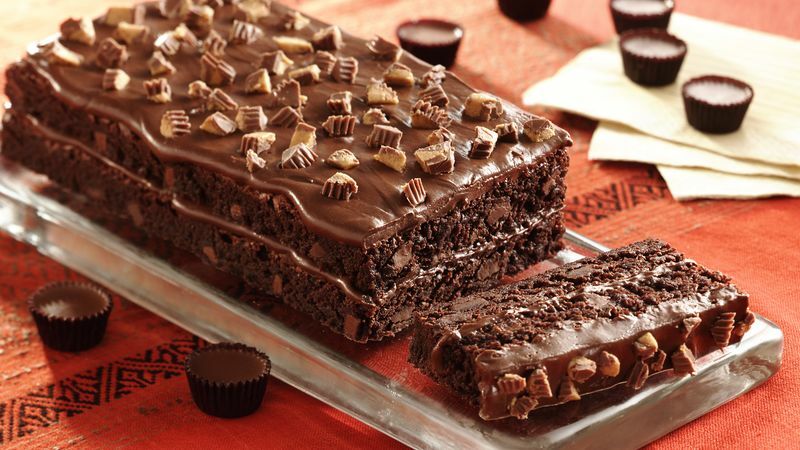 Because the frosting is poured on the brownie when it's completely cool, the frosting will appear thicker than when poured onto a hot brownie or cake.